Okay where was I? 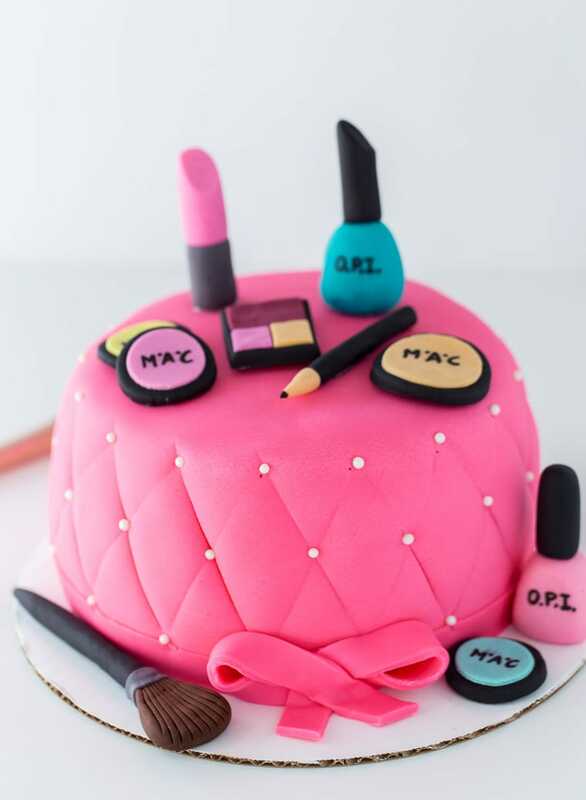 Yes, this makeup cake was the next in my yearly installment of birthday cakes for my husband’s niece. My super awesome now 15-year old favorite girlie. Ever since I was welcomed into their family, she has been my side-kick. Always excited to be in the kitchen with me baking and she loves picking out her birthday cake designs. She sent me an inspiration from Pinterest and I modeled this cake after a few that I liked. 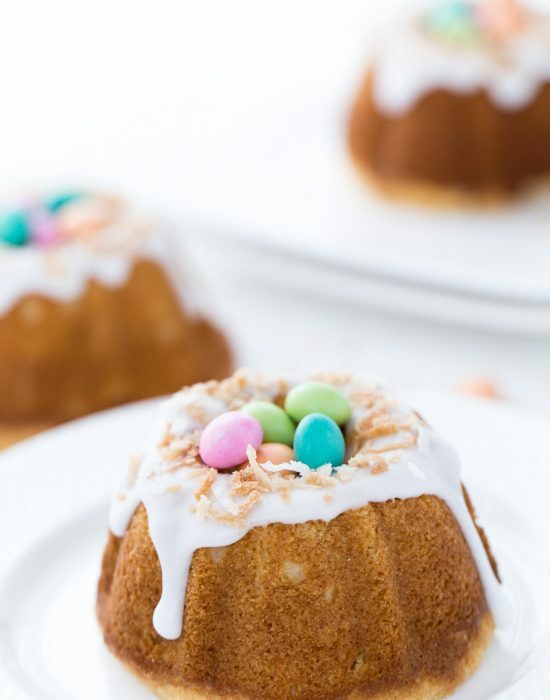 The cake itself is pretty easy to make. I know working with fondant is daunting for most but it can be very easy if you keep your designs simple and chic. For example, I opted for a simple quilt pattern design instead of complicated trimmings. 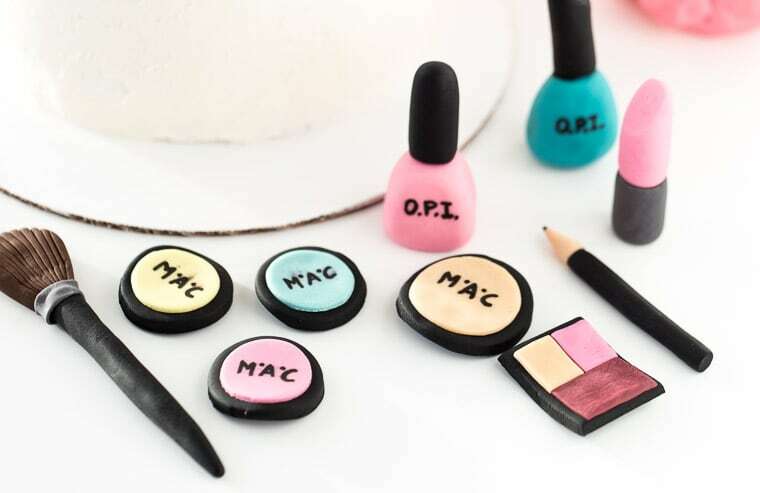 After my first attempt at the fondant makeup decorations, I decided it would be smart to buy them. I bought them on Etsy where apparently, there are a gazillion shops that make them. 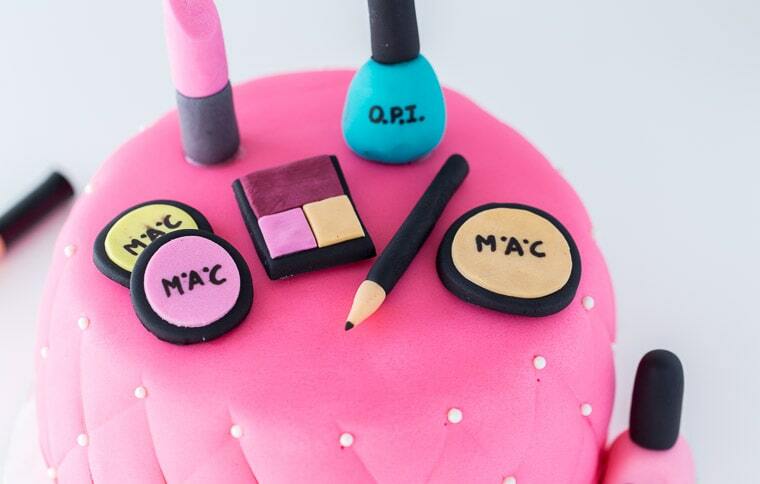 Here’s how to make this cake for the makeup lover in your family. 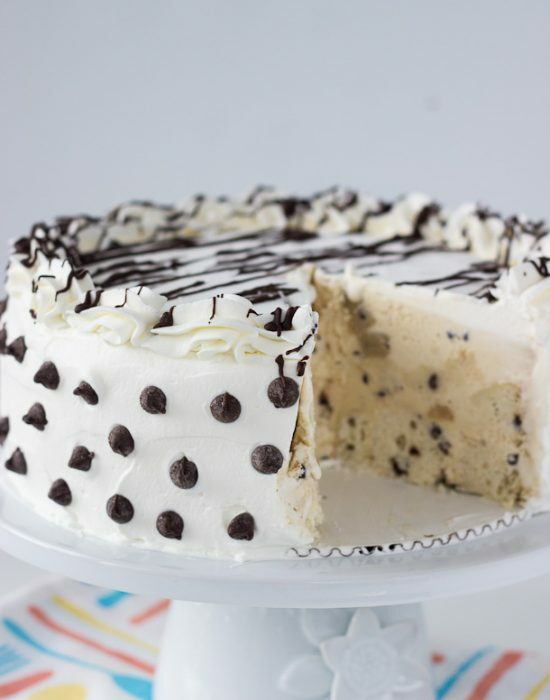 I can see this being a great cake for a shower, birthday party or even graduation! 24 ounces Pink Fondant or any color you wish. Now that you have everything that you need, let me walk you through the assembly. It’s pretty straight forward so no need to stress. 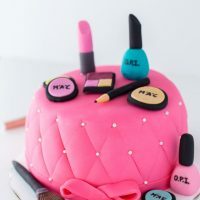 First, if you are making your own makeup cake toppers, I suggest you do this the day before assembling the cake so they dry out and are firm. As you can see, the amount and color of toppers you need depends on how you want to decorate the cake. I used lipstick, blush, pencil, etc. Next, assemble your cake. 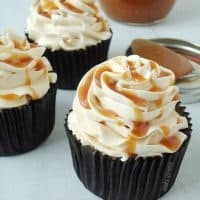 I baked this chocolate cake recipe and made a batch of that caramel frosting. My cake was three layers so it will have some height to it. Frost it roughly. 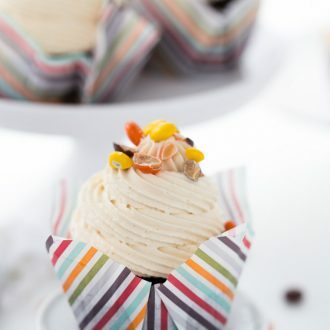 Freeze the cake briefly so the frosting firms up. Then do another layer of thin frosting around the cake and try to smooth it out. Freeze the cake again as you prepare the fondant. Next, roll out your fondant into a big circle. I used 24 ounce pack of fondant and I think rolled it into a 12-inch circle. 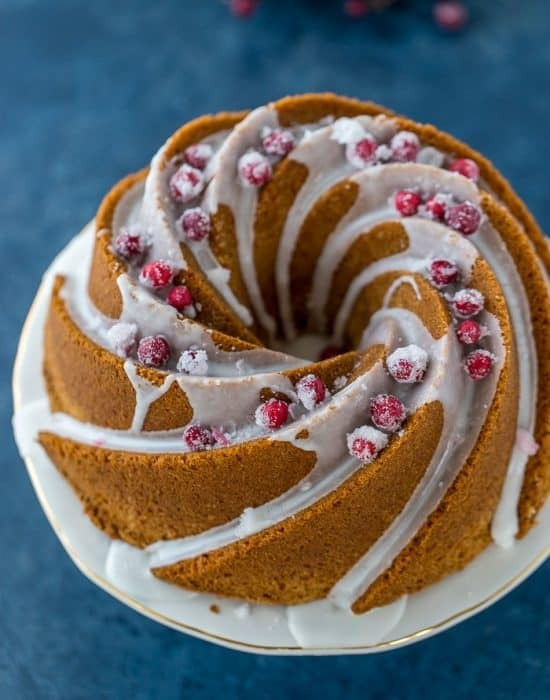 Just make sure the circle is wide enough to cover your cake. You can measure the height of the cake to be exact. Cover the cake with fondant. Smooth out and cut off excess. 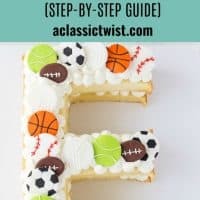 You can save some of the fondant to make a band and bow. 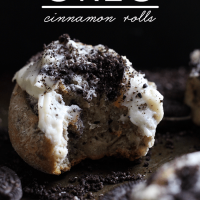 These are optional of course. For the outside of the cake, I opted for a simple quilt design. I referred to this video on how to do it with a ruler since I didn’t have any special quilting tools (like THIS or THIS). I suggest you watch the video before starting. Once you have your quilting done, use edible glue to attach a pink 2-inch band around the bottom of the cake. Add a bow at the bottom as well (the bow was just a 1-inch band of fondant folded criss-crossed. Nothing fancy). Using edible glue, attach the white sugar pearls in the intersection of each diamond. Do as many or as little as you wish. As you can tell, I added the sugar pearls after finishing the cake as I thought it needed more. And it was indeed a great addition. That’s it! It was a very easy cake to make, just like the Minion cake, it took a few hours but it was well worth it. She loved it very much and I can’t wait to see what she wants next year for her Sweet 16! For the outside of the cake, I opted for a simple quilt design. Watch the video above to help with this. 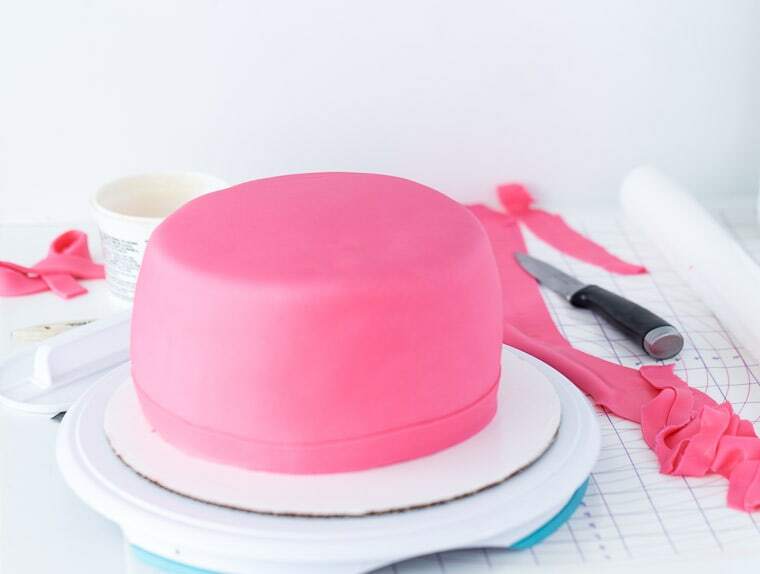 Once you have your quilting done, use edible glue to attach a pink 2-inch band around the bottom of the cake. Add a bow at the bottom as well. Using edible glue, attach the white sugar pearls in the intersection of each diamond. Do as many or as little as you wish. 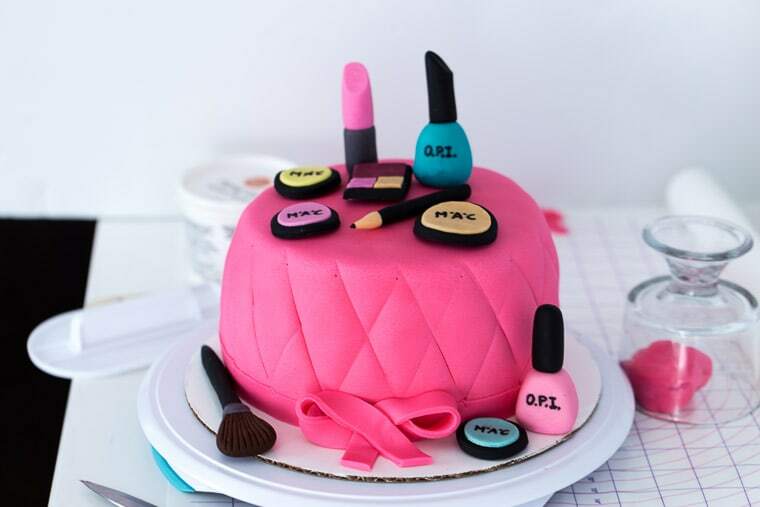 Finally, top the cake with the fondant make up decorations. Disclosure: Some affiliate links included. 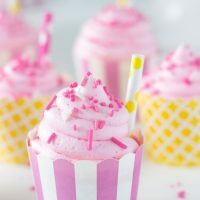 I linked to a lot of Wilton supplies because I LOVE Wilton decorating tools and use them daily. 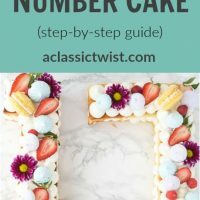 If you are starting out on cake decorating, give them a try! Thank you Lisa!!Right? Isn’t that the whole point of a blog? People! I love how close you are with your niece! This cake is so pretty-you did an awesome job! Hhaha I know people can be silly lol! Thanks dear! Wow, is your niece a lucky girl Zainab! 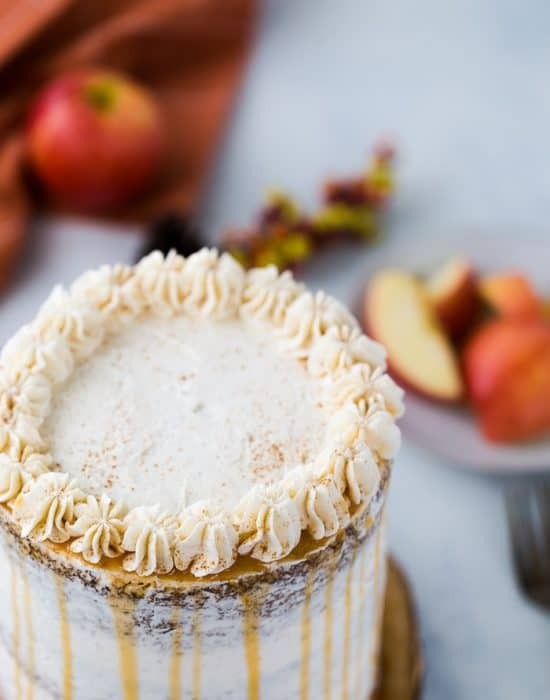 This cake is just stunning! So much love, time and hard work went into it! Well done! 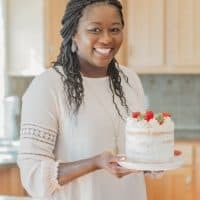 Your niece is so lucky to have an aunt as talented as you are with cakes! 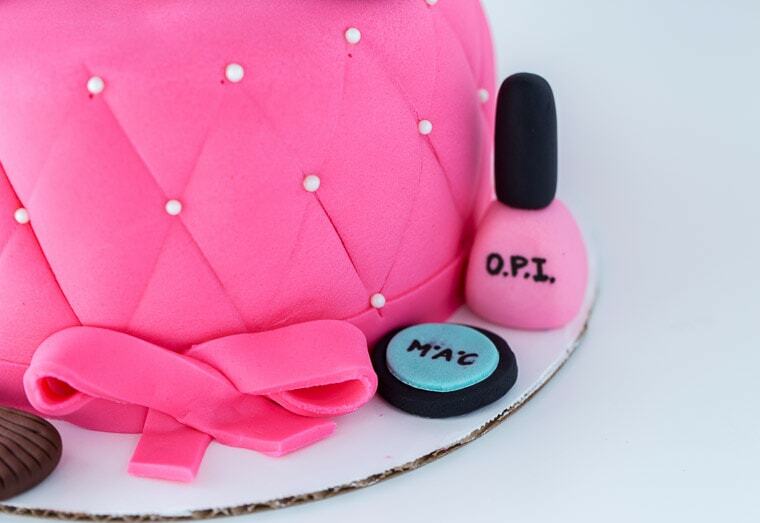 The decorations are adorable — this is perfect for a 15-year old girl, and I see you love M.A.C. and OPI as much as I do. haha This is so pretty! I am obsessed with MAC but mainly because their colors for my skin tone always works. WooooWWWW! 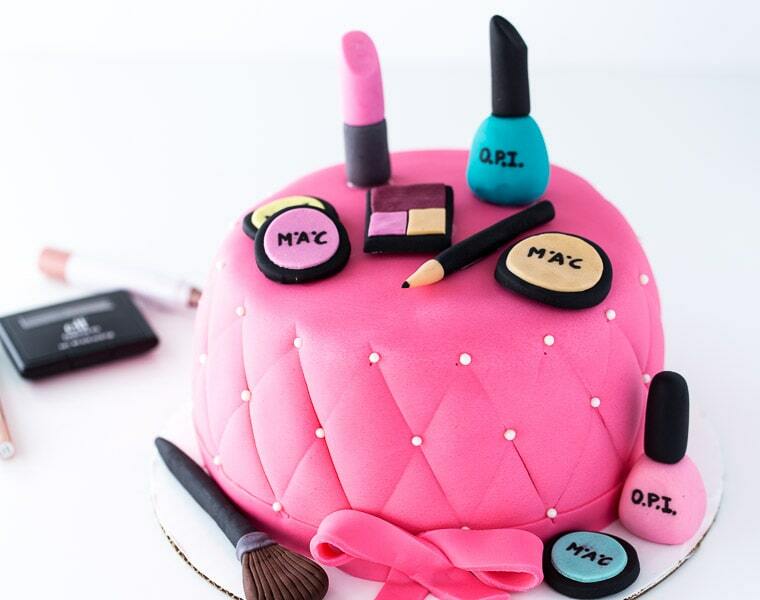 This cake is flawless Zainab! You have to be THE favorite Aunt in the family! 🙂 Look out sweet 16! Thanks Tonya!! I know I can’t wait for her sweet 16. You are so talented, Zainab! This cake is amazing and I bet it was fun to make too. Thank you Laura! I love decorating cakes! Thanks Ashley! She loved it! Holy crap, this is amazing! I am so impressed! Hey Zainab! Love your cake and attention to detail. You are extremely talented and pay so close attention to detail. 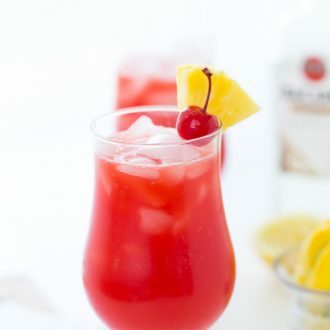 One of the ingredients you mentioned is a paint brush. Is there a specific one you use to paint the details? I find most of them are either too big or too stiff. Lynda, I used a very small paint brush. 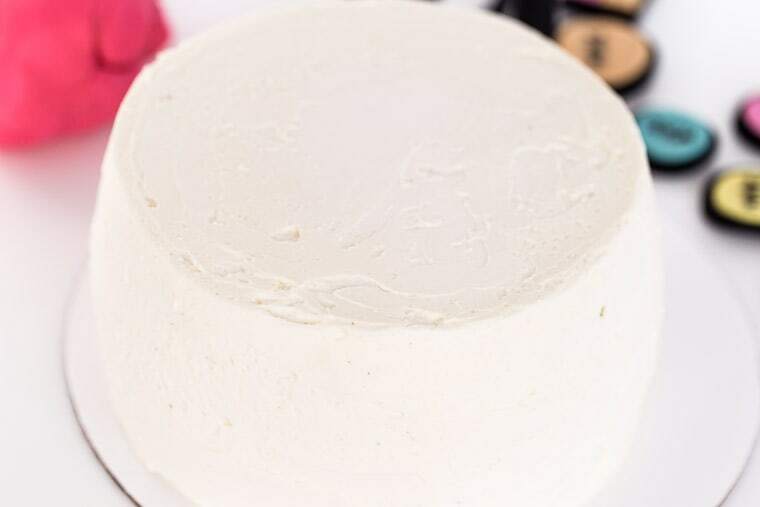 It is easier to brush the edible glue onto the fondant with a small paint brush. I got mine from the craft store..Michaels I believe. 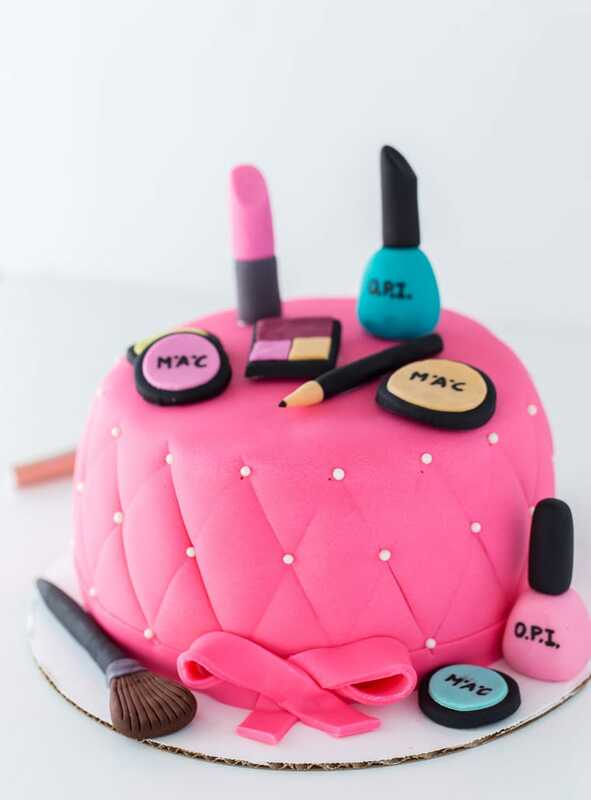 This is such a fun cake for a teen girl! I’m sure it was so appreciated by your niece! Thanks Linda! It was a fun break indeed from writing. I am pretty sure you earned BEST AUNT STATUS for this!! Amazing. Also, it gives me so much hope in life that you were able to have a child AND make this. Double amazing.